Synopsis: WaterTower Music, Warner Bros. 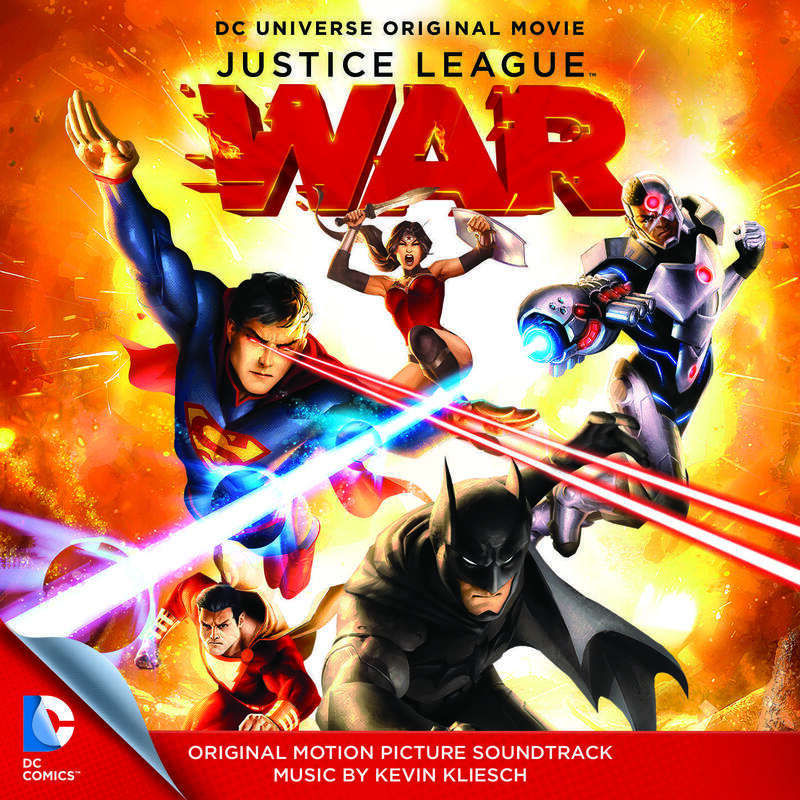 Animation and DC Comics present the original motion picture score to the DC Universe Animated Original Movie Justice League: War featuring music by Kevin Kliesch.When the powerful Darkseid and his massive, relentless forces invade Earth, a group of previously unaligned super heroes – misunderstood and, in some cases, hunted by the authorities – discover the only way to fend off the attack will be to work together as a cohesive unit. Batman, Superman, Wonder Woman, Green Lantern, Flash, Shazam and, in his origin story, Cyborg combine their respective talents in an all-out battle to save the planet. 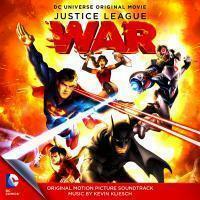 Composer Kevin Kliesch brings together a strong, pumping score, emphasizing the epic nature of the Justice League: War animated film. The score starts off with an uplifting, almost majestic feel, especially in the second track, before the foreboding nature of the film's plot takes over and starts the overall larger-than-life theme that seems to run through this entire soundtrack album. All of this is intermingled with beats meant to emphasize some of the more quiet moments of the film, but still, almost every tracks has an underlying sense that danger is around the corner. While the first third of the album has a pretty driven beat throughout, an almost calm pace to the music also provides a nice build-up to the onscreen action. However, the music really seems to elevate in intensity as the second third of the soundtrack commences. Track ten acts as that bridge. The mysterious background music emphasizes the unknown dangers that Darkseid and his Parademons present, and provides a segue-way into track twelve - where the Parademons are unleashed on the world - and track thirteen. 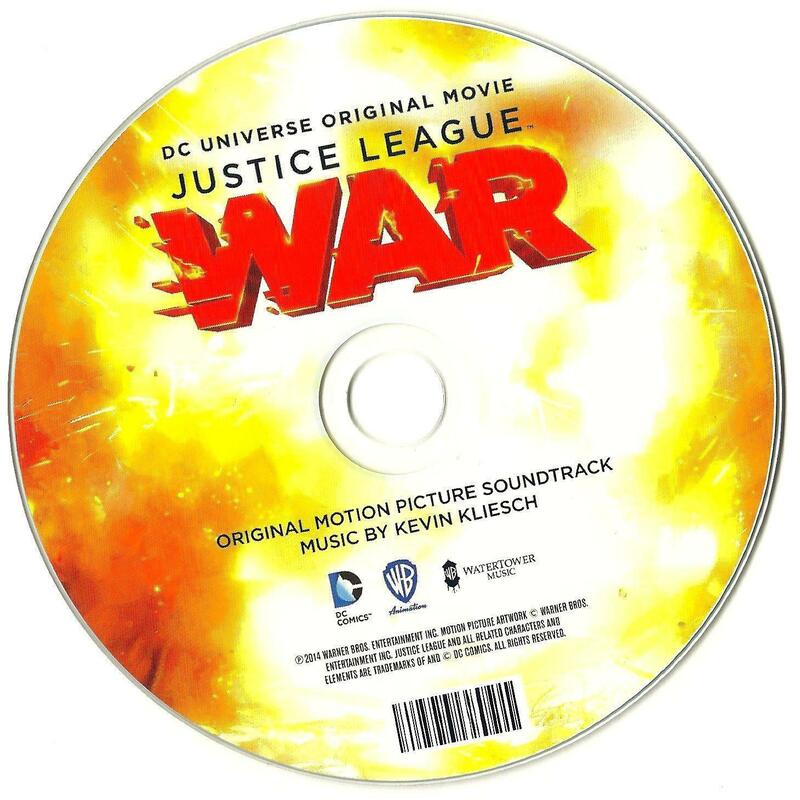 Track thirteen is a huge, hulking, blasting track which perfectly underscores the introduction of Darkseid and his lumbering threat to our heroes and the world. 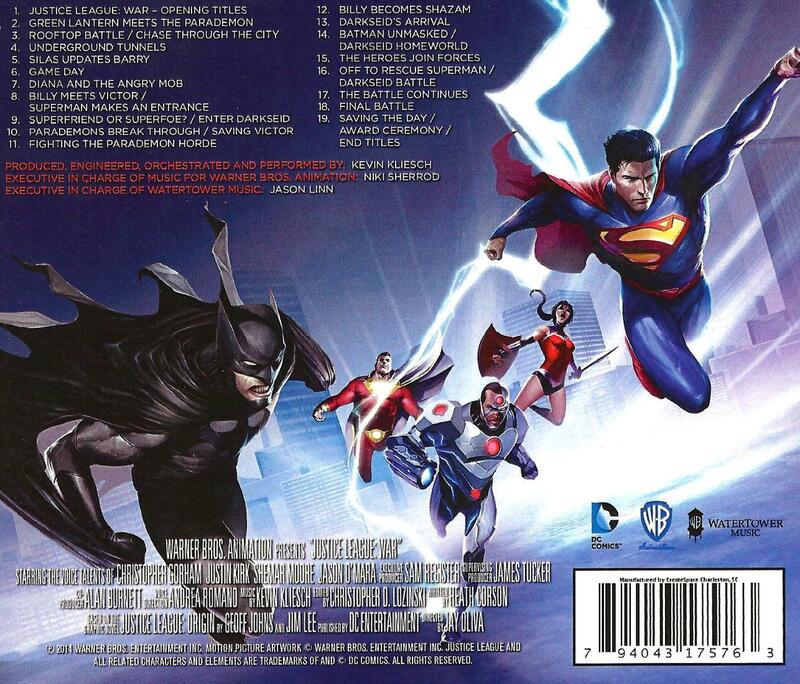 The final act of the soundtrack really kicks with track fourteen, as Batman prepares to go after Darkseid and Superman. It emphasizes a feeling of hope, just for a fleeting moment, before all chaos breaks loose again and our heroes are battling for survival. Track fifteen immediately after gives the film it's big heroic theme, but one that keep in line with the film's underlying themes of danger and suspense. The urgency of the film is perfectly encapsulated in tracks seventeen and eighteen, as both tracks score the massive action sequences the wrap up the film. Loud, thundering and boisterous, these tracks are a fitting compliment to the onscreen action and nicely lead into the quieter final tracks to the album. Its worth noting that track nineteen has a great orchestral heroic theme that, easily, is my favorite piece of music in the entire soundtrack. 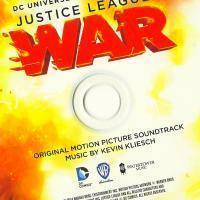 Overall, the Justice League: War soundtrack release is exactly what you'd expect. Its a fast-paced, epic sounding music rundown of the film's action-packed plot. While the shortcomings of the film's budget is evident on occasion - there is the odd moment here and there where the synth music sounds somewhat cheap and weak - the composition work and overall execution is great. If you're a fan of the film then there's a good chance you'll appreciate the work put into the animated movie's musical score. The soundtrack is easily worth the relatively low price of the admission, so check it out! Justice League: War and related characters and indicia are property of DC Comics and WB, 2001 - 2014.